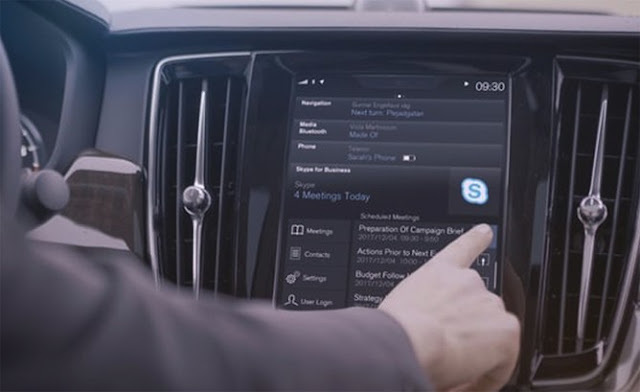 Volvo Cars, the premium car maker, has announced that it will introduce Skype for Business, Microsoft’s leading collaborative productivity app, to its new 90 Series cars. Volvo Cars is the first carmaker to launch such an in-car productivity tool. “We’ve all been there. Sitting in the car trying to join a conference call. You either fumble with or drop your phone while trying to connect or you forget the long pin code to join. It’s not the best way to start an important call in the car. On top of all that your attention is not where it should be – on the road. With the addition of Skype for Business all that goes away,” said Anders Tylman-Mikiewicz Vice President Consumer Connectivity Services at Volvo Car Group. Skype for Business is actively used by millions of people at work around the globe. In Volvo’s 90 Series cars people will be able to view their upcoming meetings and participant details, and join meetings with one click via the large centre display.